﻿﻿We also wanted the nursery to be practical. I splurged for a very plush rocking chair and I have never once regretted that decision. 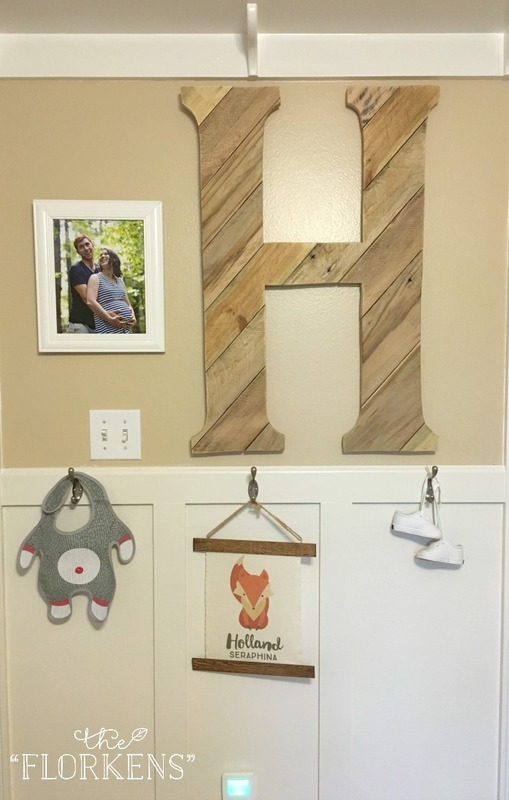 In fact, that rocker has quickly become my favorite part of Holland's room. We also wanted all of our cloth diapering needs to be very handy. You see that we repurposed (and repainted) planters to hang over her dresser (which used to be blue.. yes BLUE! I refinished it) to hold her cloth (and the disposables that she currently sleeps in at night). 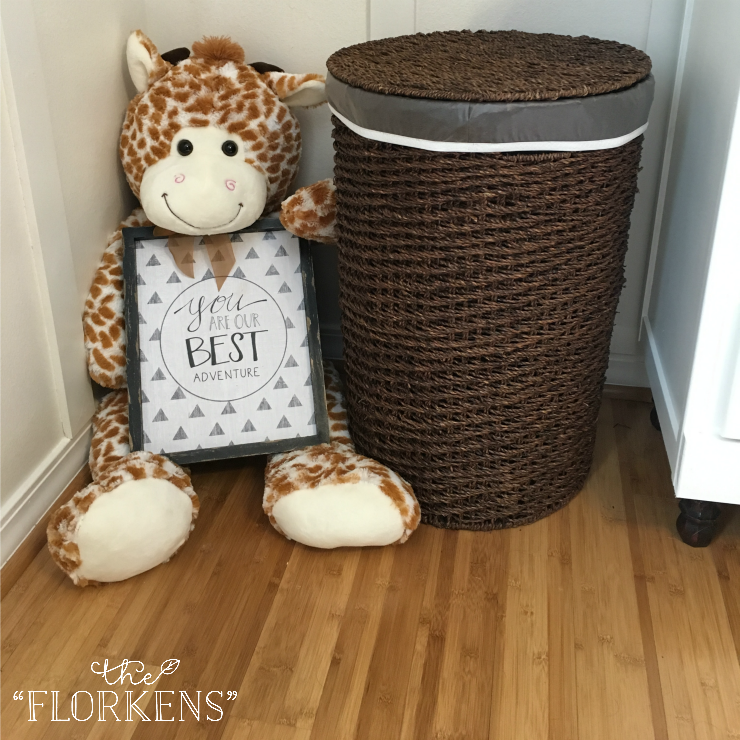 Beside the dresser, we have our dry pail for dirty cloth diapers (if you want to know more about our cloth diapering routine let me know and I'll share) and beside the crib we have our regular dirty clothes hamper. This AH-DORABLE animal hamper was the hostess gift at my shower and I love it so much. It too, was a total splurge, and I am so thankful it was gifted to us because it works so well in the space. 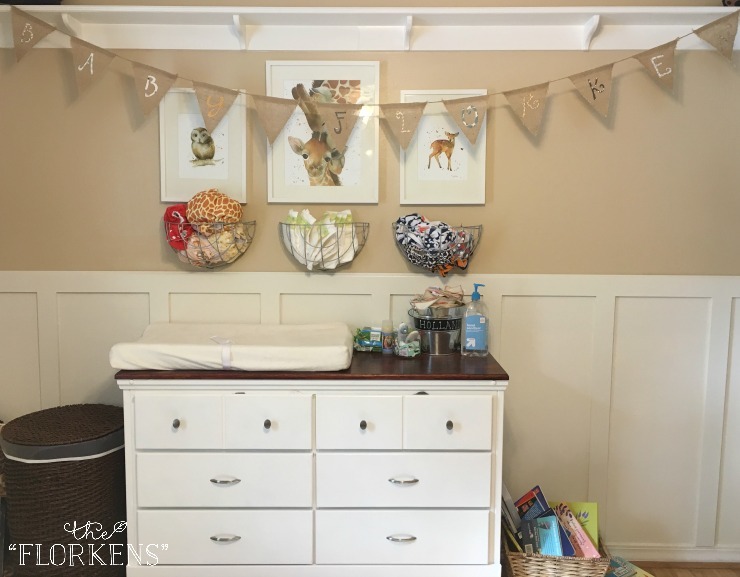 The Baby "Florken" banner was used as decoration at our baby shower and once I saw it, I knew I wanted to incorporate it into our nursery. I found that hanging it over the dresser/changing station was the perfect touch. I personally think that the "stars" in this nursery are the beautiful watercolor prints from The Daily Watercolor, the giant, handmade, wooden "H" from PlaneAndSaw (which you see monthly if you follow us on Instagram) and the beautiful mobile I made using a wooden stump sign created by AmberThomasMakes and some straw animal figurines. 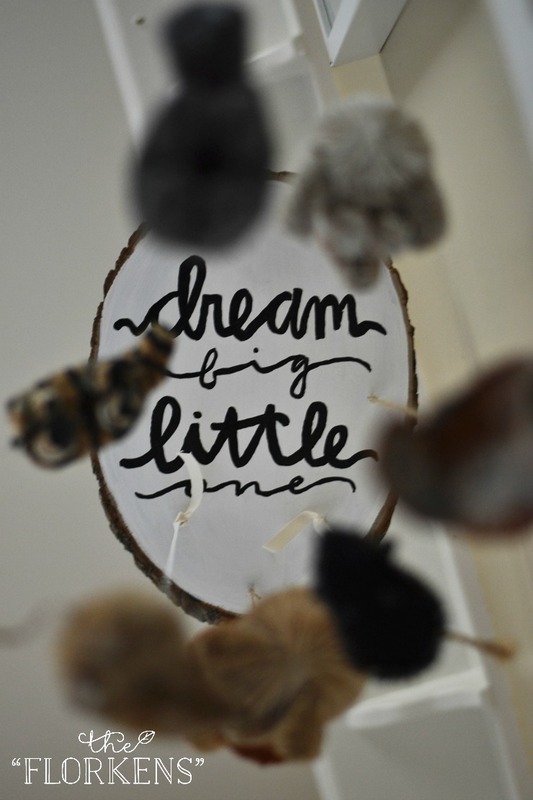 These touches seem one of a kind and really sets our nursery apart from a lot of others I've seen. Holland's nursery has easily become my favorite room in the entire house. If you have any questions about where we found certain products, feel free to ask in the comments and I'll try to answer (if I remember). 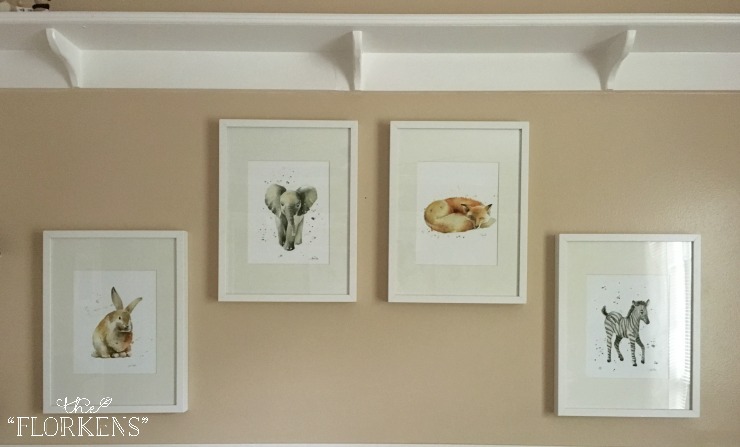 Our goal was a very relaxing and neutral space that would, hopefully, help our little love animals as much as we do. I think we did an excellent job and I love watching our little Holland grow up in this space. It's perfect. I love all the neutral tones and its so "you". I love Holland's nursery. It looks like a very calming space. I love all the details and how practical it works for y'all. Plus, if y'all decide to add more bambinos down the road you can reuse items. Very smart thinking to buy a very comfortable chair. Such a beautiful space! You guys did an amazing job! I really love it! 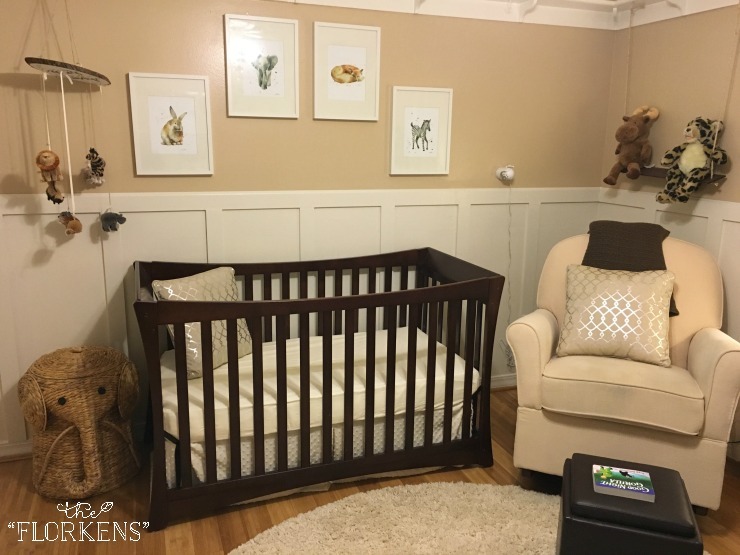 I didn't really spend that much time on our nursery & it turned out nothing like I wanted! Yours is beautiful. I really love those prints! this is so beautiful! this was our goal for Amelia's nursery too. gender neutral and calm. 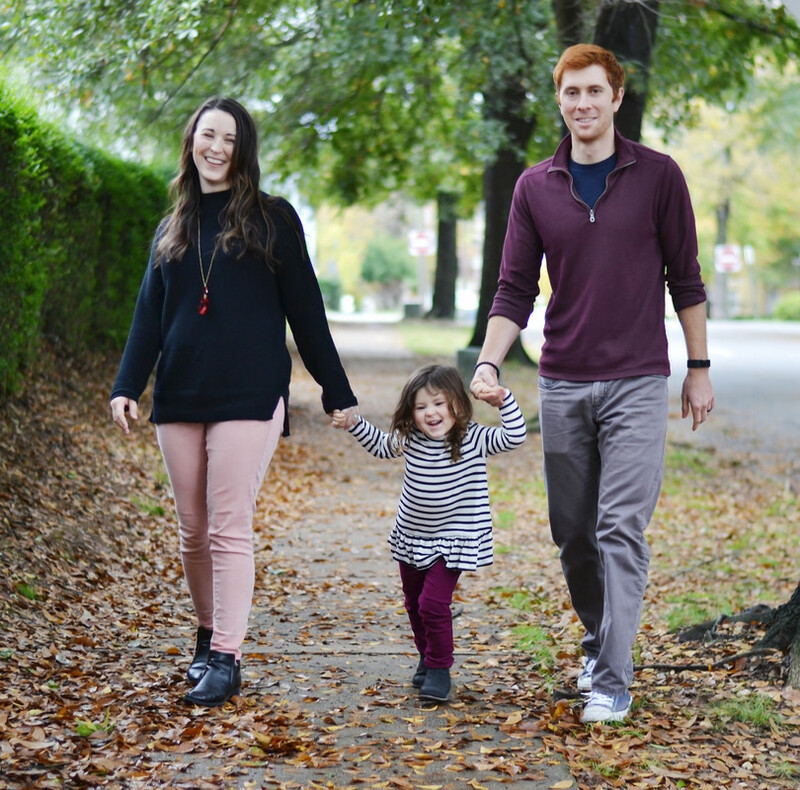 our cloth/disposable diapering setup is more hidden (we do cloth during the day, disposables at night too), but I would have loved to do something like you have! This nursery is amazing! Love the perfect mix of practical and pretty, and it's neutral but still has personality :) I'd love to hear more about your cloth diapering...I'm expecting my first baby in September and my family thinks I'm crazy that I want to use cloth! 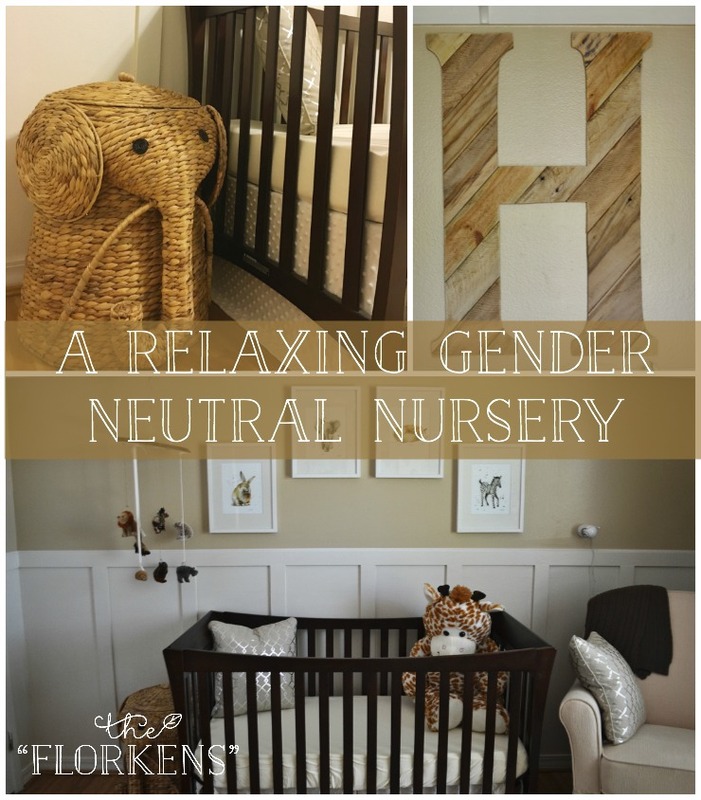 And we did a gender neutral nursery too, grey and white. It's so cute! I love all of the little details! Confession: I'm still working on Bensen's nursery and he's 13 months old :P Here's to having it finished before baby #2 arrives!